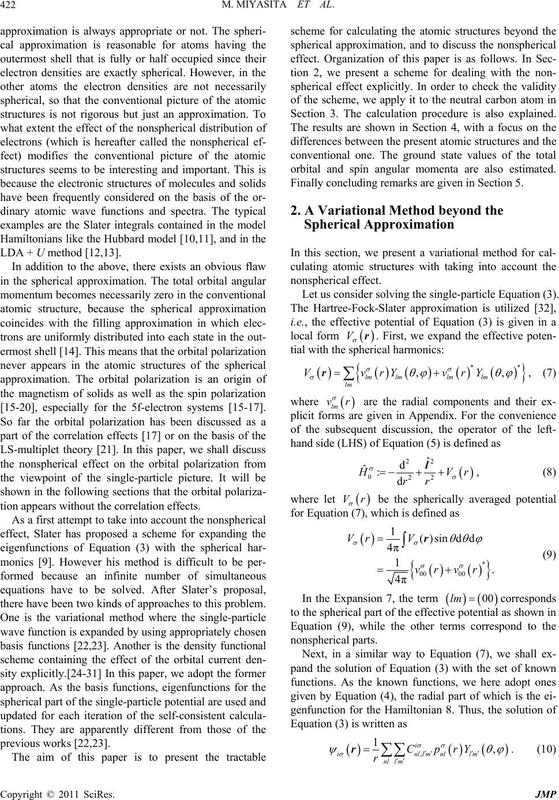 of the magnetization caused by the orbital polarization. are the spherical harmonics . LDA + U method [12,13]. [15-20], especially for the 5f-electron systems [15-17]. tion appears without the correlation effects. there have been two kinds of approaches to this problem. Section 3. The calculation procedure is also explained. orbital and spin angular momenta are also estimated. Finally concluding remarks are given in Section 5. 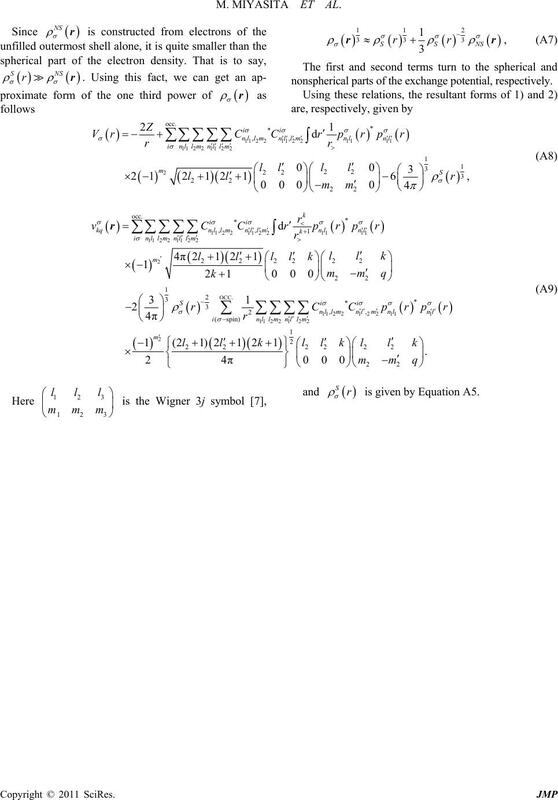 Let us consider solving the single-particle Equation (3). disregarded in the conventional spherical approximation. tials by means of the expressions given in Appendix. These potentials should coincide with the input ones. sistency for the potentials is achieved. within the spherical approximation (Step 1 in Figure 1). spherical potential calculated from the new potential. we apply it to the neutral carbon atom. Figure 1. 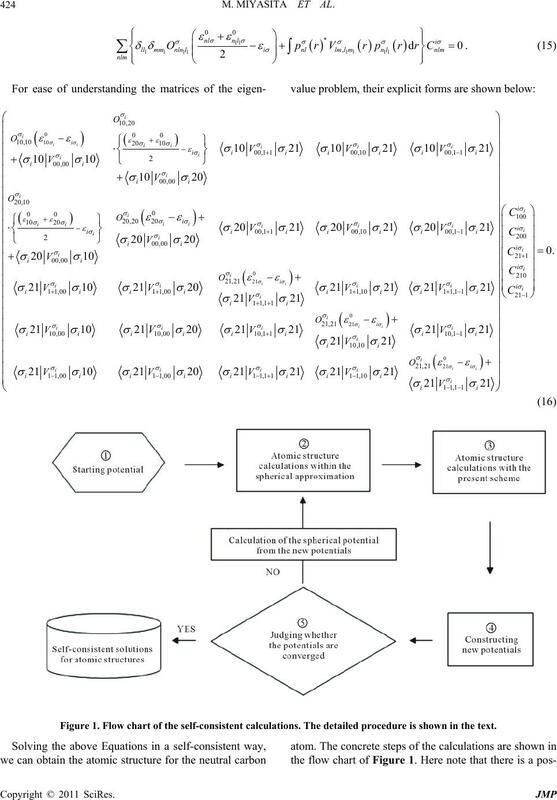 Flow chart of the self-consistent calculations. The detailed procedure is shown in the text. tained correspondingly to the starting potentials. the 1st and 2nd states of the present scheme. are higher than the single one, and another is the opposite. states are little influenced by the nonspherical effect. functions, i.e. 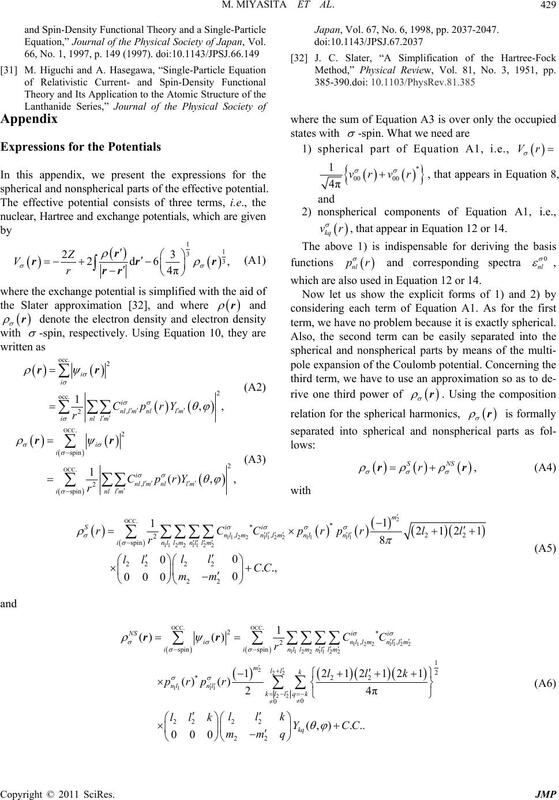 the expansion coefficients of Equation (10). states. All values are given in Rydberg Unit. for the 1st, 2nd, 3rd and 4th states are shown in Table 1.
state values of the total orbital and spin angular momenta. 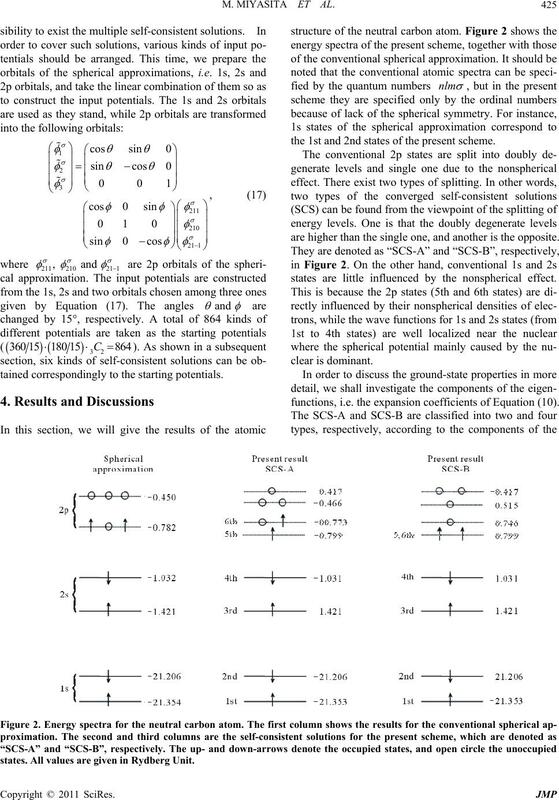 same results, so we don’t lable SCS-A and SCS-B distinctly. and SZ, are shown in the 3rd and 4th columns. generate with respect to the orbital angular momentum. seems to be conceptually important. and 2p orbitals in the expansion of the eigenfunctions. single-particle picture of atomic systems. Noncoulomb Central Field. PartI: Theory and Method. Für Physik, Vol. 61, No. 1-2, pp. 126-148. Gas,” Physical Review, Vol. 136, No. 3B, 1964, pp. Review, Vol. 140, No. 4A, 1965, pp. 1133-1138.
tions,” Prentice-Hall Inc., New Jersey, 1963. John Wiley & Sons, NY, 1979.
ceedings of the Physical Society, London, Section A, Vol. Stoner,” Physical Review B, Vol. 44, No. 3, 1991, pp. Vol. 52, No. 8, 1995, R5468-R5470. Ni,” Physical Review B, Vol. 42, 1990, 2707-2710. O. Eriksson, M. S. S. Brooks and B. Johansson, Phys. ant Magnets” Physica B, Vol. 192, No. 1-2, 1993, pp. view B, Vol. 59, No. 10, 1999, pp. 6813-6823.
ters, Vol. 64, No. 10, 1990, pp. 1162-1165. 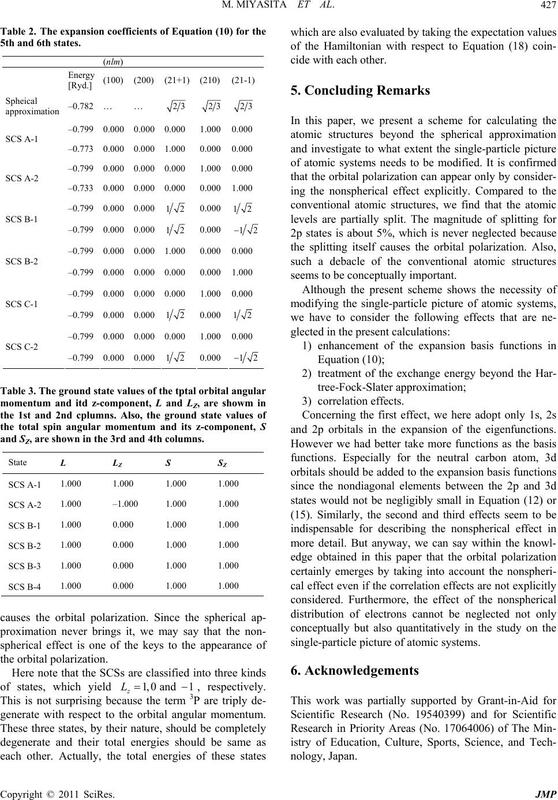 Transition-Metal Compounds,” Physical Review B, Vol. 44, No. 21, 1992, pp. 12054-12057. Physical Society of Japan, Vol. 75, No. 2, 2006, pp. Review B, Vol. 23, No. 12, 1981, pp. 6301-6306. Vol. 59, No. 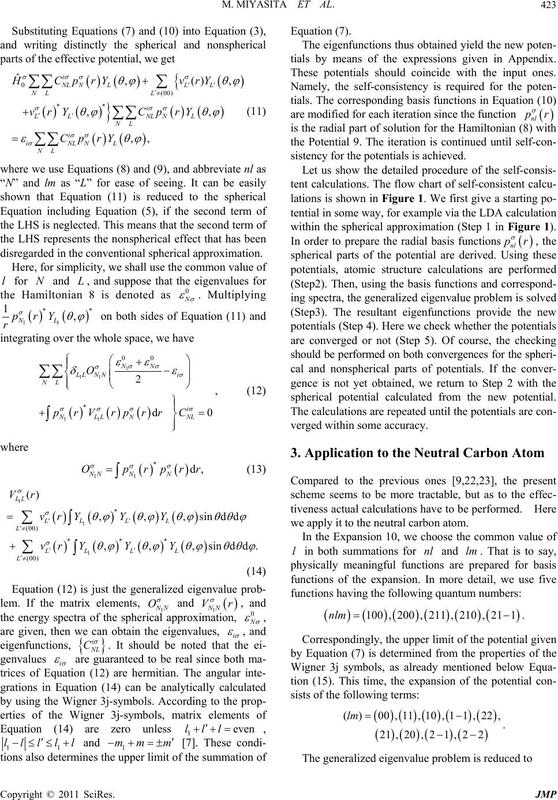 12, 1987, 1285-1288.
International Journal of Quantum Chemistry, Vol. 27, No. 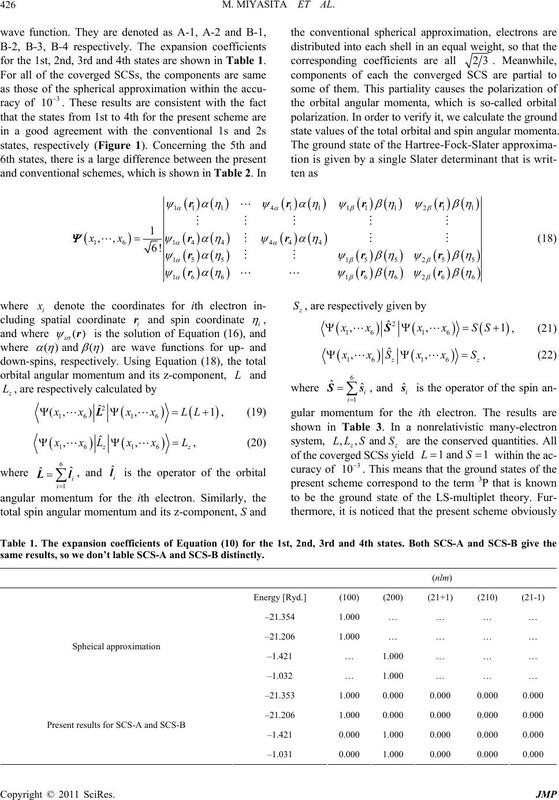 Chemical Physics, Vol. 117, No. 15, 2002, pp. 6935-6938. Vol. 103, No. 5, 2005, pp. 516-522. 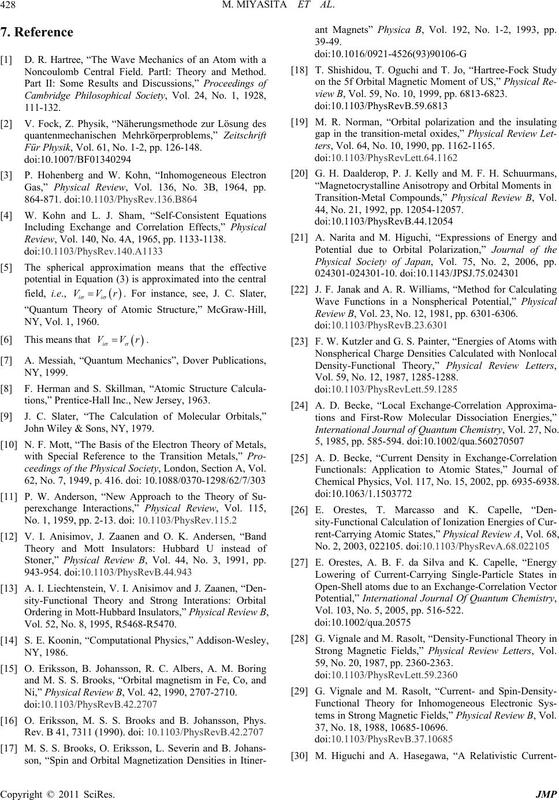 Strong Magnetic Fields,” Physical Review Letters, Vol. 59, No. 20, 1987, pp. 2360-2363.
tems in Strong Magnetic Fields,” Physical Review B, Vol. 37, No. 18, 1988, 10685-10696. 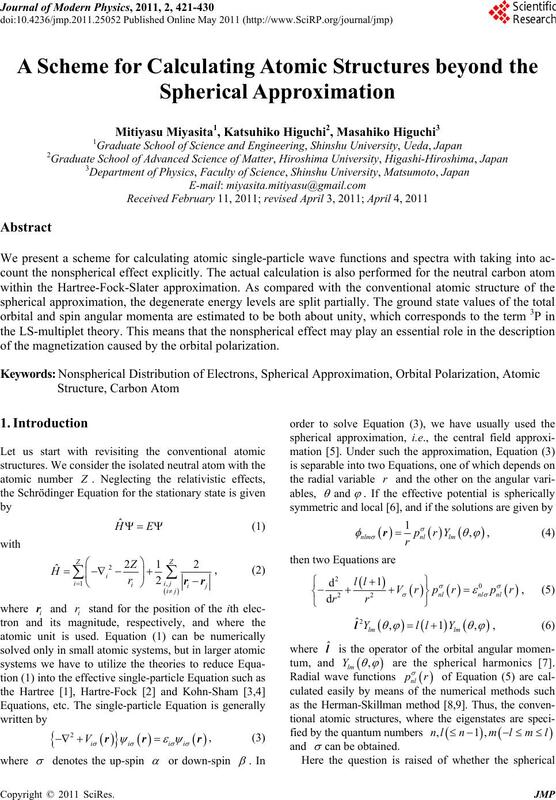 Equation,” Journal of the Physical Society of Japan, Vol. Japan, Vol. 67, No. 6, 1998, pp. 2037-2047. Method,” Physical Review, Vol. 81, No. 3, 1951, pp. spherical and nonspherical parts of the effective potential. , that appear in Equation 12 or 14.
which are also used in Equation 12 or 14.
term, we have no problem because it is exactly spherical. nonspherical parts of the exchange potential, respectively. is given by Equation A5.